In the wake of a federal judge’s decision to grant a temporary restraining order (TRO) blocking a Texas firm from posting 3-D technology online with plans on how to make a gun on a 3-D printer, Fox News Senior Judicial Analyst Judge Andrew Napolitano predicted that ruling will be overturned. 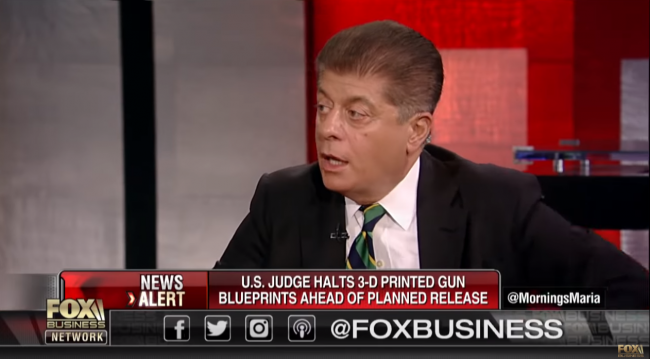 Appearing on Fox Business, Napolitano explained “prior restraint” and why it is not okay under the Constitution, because it impairs the right of free speech. “I don’t know where this is going to go,” the judge explained. “I don’t think…I just read the judge’s opinion a few minutes ago…I don’t think he adequately addressed the First Amendment issues. The case revolves around an effort by Defense Distributed and founder Cody Wilson to post online the information necessary to create a gun on a 3-D printer. Led by Washington Attorney General Bob Ferguson, a group of attorneys general from eight states and the District of Columbia petitioned the U.S. District Court in Seattle to prevent the information from being posted online. On Tuesday, District Judge Robert Lasnik, a Bill Clinton appointee, granted a TRO, but scheduled another hearing on Aug. 10. Ferguson was joined by attorneys general from neighboring Oregon, plus New York, Maryland, New Jersey, Massachusetts, Connecticut, Pennsylvania and the District of Columbia. The National Rifle Association’s Chris Cox, executive director of the Institute for Legislative Action, quickly responded. “Many anti-gun politicians and members of the media have wrongly claimed that 3-D printing technology will allow for the production and widespread proliferation of undetectable plastic firearms,” Cox said. But she should know about the 1988 law preventing “untraceable” guns. Meanwhile, a California-based group calling itself Code Is Free Speech has launched its own website, complete with links to various files that contain information on the designs of several different firearms.